After going through surgery and several rounds of chemo or radiation therapy, the Australians cancer patients keep on contacting us to learn whether Rigvir® can be a suitable cure for diseases like metastatic melanoma, colon cancer and adenocarcinoma. Other inquiries often relate to the treatment duration, side effects, the Rigvir® virotherapy costs as well as in- and outpatient care options. We have provided the answers down below and pointed out all medical reports you need to have ready in place to qualify for Rigvir®. Let’s get straight to the point. Discovered and researched in the 1960s by the team of Aina Muceniece, a Latvian scientist and immunologist, Rigvir® has become the first oncolytic (naturally occurred virus that infects and kills cancer cells) virus-based cancer medication without being genetically modified. It proved to extend the survival of the late-stage melanoma, gastric and gastrointestinal cancer patients from three to five years as the study said. The virus comes into collision with cancer cells by multiplying inside them and destroying the tumor from within. In such a way, it stimulates your immune system to resist the disease in a natural way. And what is more, this process does not have a negative impact on other healthy tissues. The most common side effect caused by Rigvir® is a non-significant increase in temperature (up to 99.5°F), which is also good for the immune system proper functioning. 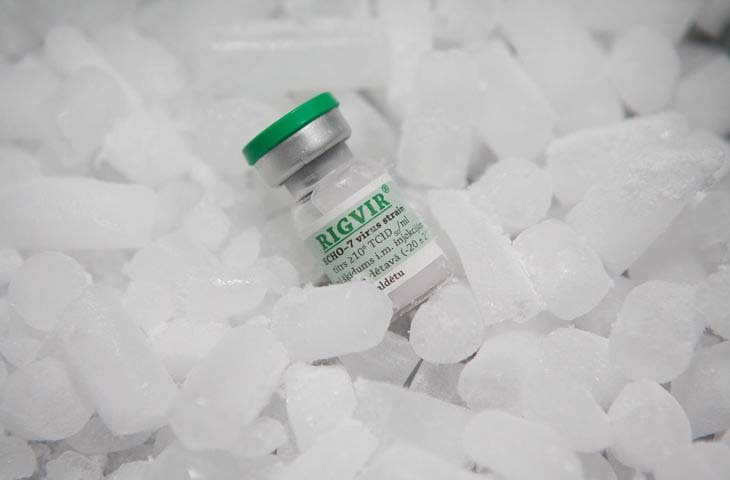 It means that Rigvir® can be safely combined with chemotherapy and radiation therapy or used alone as the main treatment. If you happen to search for Rigvir® on the Cancer Australia website, you will have no matches found. Being officially registered in Latvia back in 2004, the Rigvir® virotherapy medication is also approved by the state authorities of Georgia (2015) and Armenia (2016). But the list of countries will expand as the medication passes the standard clinical trial procedures enforced in Europe. The thing is, the European Commission has funded the Rigvir® manufacturer to further introduce it to the European market by providing the Horizon 2020 grant (the programme favoring research and innovation). So getting Rigvir® approved by the Australian Government may be the goal to be achieved in the long run. Meanwhile, you still can receive the Rigvir® treatment either distantly without leaving your home country, Australia, or in the Latvian clinic. To learn more about other locations, read about virotherapy in Canada and virotherapy in the UK. Being initially created for melanoma treatment, Rigvir® is applied off-label to a wider range of diseases including colon, stomach and bladder cancer. Just take a look at the image below. 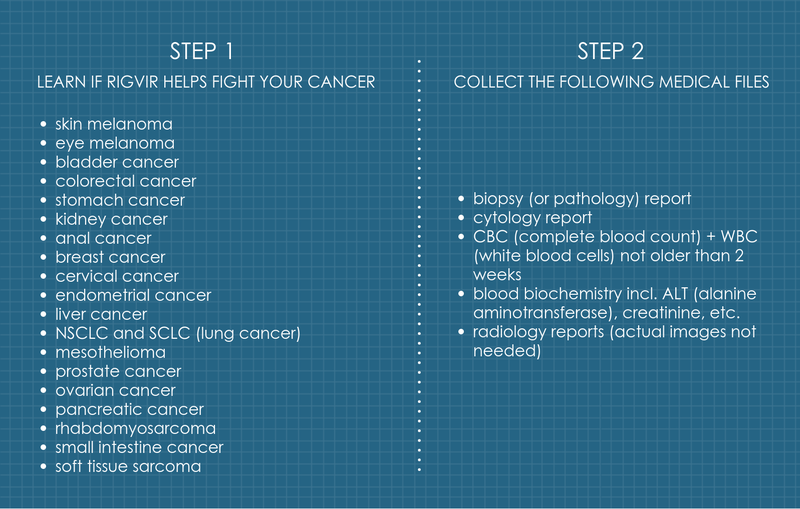 The first column shortlists all the tumor types Rigvir® can be appropriate for. They are mentioned from more Rigvir®-sensitive to less Rigvir®-sensitive diseases, so please do pay attention to that. Besides, there is no need to translate the documents, since all the clinic doctors speak good English. Once they receive your request, it will be examined by the board of the oncologists in the Latvian clinic to make sure that Rigvir® is a good fit for you. Right after the decision is made, you will get a response within three business days at latest. Importantly, your case will be evaluated free of charge. For European locations, read about Rigvir in Romania. Please note: Rigvir® cannot be used for the treatment of the liquid malignancies like myeloma and leukemia. Similarly, there is no proof that it can be of help when dealing with glioblastoma, bone cancer, gallbladder cancer and some other tumors. And most importantly, Rigvir® must be used to treat patients above the age of 18. Flying from Australia to Latvia is rather tiresome, so if health permits, get ready for the trip well in advance. On average, it takes from 24 to 35 hours to get to Riga (Latvia) from the Australian airport in Melbourne with two stops. If you choose to book the flight with KLM and Air France, the price for tickets will be about AUD 2,253.00 - 2,675.00 with stops made in Shanghai Pu Dong (China) + Paris (France) and Amsterdam (the Netherlands) + Kuala Lumpur (Malaysia). 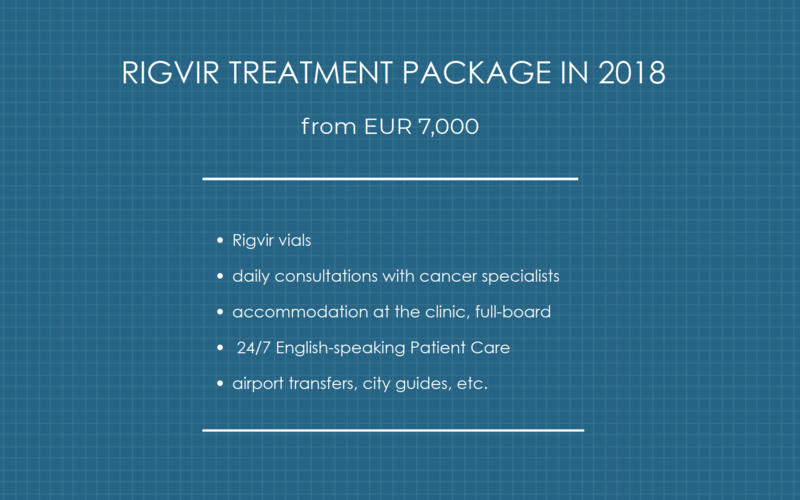 Booking round-trip tickets beforehand, say, in six months before the Rigvir® therapy starts, will save you about AUD 600.00. For you not to spend hours searching for some extra stats on the treatment with Rigvir® or its medical reviews, we have collected the essential facts right in this passage. From three to five years for the melanoma patients treated with both surgery and Rigvir® (57-84% for a three-year survival rate and 44-66% for a five-year survival rate). From three to five years for the patients diagnosed with eye melanoma (90% and 70% respectively). The five-year post-surgery survival rate for the third-stage stomach cancer patients (47-60% patients showed such survival rate). The five-year post-surgery survival rate for the stage 2-4 rectal cancer patients (proved by 71-78% of cases). So far, you may still have quite a lot of questions about the Rigvir® delivery, Complex Virotherapy Package or other issues. To get answers via Skype or email, please click the red button below and we will reach out to you within 24 hours.